The City Creek Complex in downtown Salt Lake City was completed in March. Located directly across from the Temple Square, the project occupies the historic site where City Creek once traversed the land when the Mormons first settled the valley. The landscape takes the historic creek and surfaces it, forming a mountain stream and leading to a grand cascade of waterfalls over locally quarried stone. Boulders weighing 12.5 tons each were installed with a tower crane. Recycling water fills the series of pools that evoke the historic creek, the new home of 200 rainbow and cutthroat trout. The urban renewal project also contains urban living, offices, and retail intermixed with pocket parks, roof gardens, and connective elements. 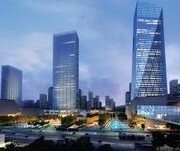 Dongtan City, a new urban center just south of Seoul, South Korea, will feature a Central Business District and transit center designed by SWA Group and Ojanen Chiou Architects. The site will have incredible local and regional connectivity through a system of high speed rail, regional rail, tram and bus lines, establishing Dongtan City as a major regional transit hub. Additionally, it will serve as a major new business center with schools, retails, hotels, office buildings, plazas and various cultural facilities. 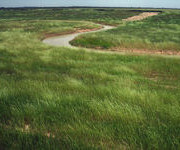 The programmatic elements are part of a larger landscape infrastructure, which follows the unique topography of the site and its hydrology—utilizing it to become part of the integral water management system. Nate Berg speaks with SWA President Gerdo Aquino for The Atlantic Cities about the necessary funds, support and time needed by such projects in order for them to be successful. Infrastructural elements such as alleyways, drainage, and electricity transmission corridors are often overlooked and unseen for their other potential usage. SWA Group’s Landscape Infrastructure book features a handful of recent case study projects that illustrate ways infrastructure can serve double duty, or more. The latest installment of Mission: Impossible featured a heart-pounding climb up the Burj Khalifa tower. The landscape design around the tower, by SWA Group, appeared on billboards, movie previews, and on the IMAX screen as the backdrop of Tom Cruise’s climb up the world’s tallest building. This is perhaps the most thrilling and terrifying view of an SWA design we’ve ever seen. SWA Group and the Buffalo Bayou Partnership will commence a major restoration project along a 2.3 mile stretch of Buffalo Bayou in Houston. Just approved by the City Council, the $50 million, donation-funded project will double the amount of trees, create a performance pavilion, dedicated dog park, and nature playground, and add new walking and biking trails through the area. In reshaping the Bayou, the plan will restore the natural course that was decimated during a 1950’s flood control project. The Atlanta Connector Transformation Project is a collaborative effort between the City of Atlanta, Georgia Department of Transportation, Downtown and Midtown to improve the experience of the more than 300,000 people who travel along the I-75/85 Connector daily. By re-inventing how we see and care for our infrastructure, SWA’s transformation of the Connector serves as a catalyst that can change the perceptions of our freeways. It turns out that an 800-acre parcel slated for housing on prime Wisconsin farmland is the perfect place to put urban agriculture into practice. The Laguna Beach office has designed a development, slated to break ground this month, that surrounds homes with orchards and annual crops. Putting sustainability and preservation as the top priorities of the project, the organic farm will sell its produce locally, and a Community Supported Agriculture (CSA) program will be available to residents. The innovative design uses grade changes to elevate homes above the dust of the farm, and to give homeowners a view of the beauty of the farmland they have helped to preserve. SWA’s Summer Program enters its 37th year with students arriving in San Francisco this June to embark on a 4-week study of the Central Corridor and the city’s urban design challenges. 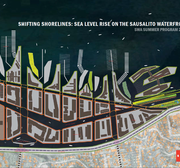 Previous programs have looked at Sea Level Rise in Sausalito, the complexity of Vallejo’s downtown waterfront, and The Third Ward in Houston. Since its inaugural year, 47 of the students from our programs have gone on to become full-time employees with SWA, four of whom are now SWA Principals. In March, the Graduate School of Design at Harvard hosted a two-day symposium to re-think the power and future of infrastructure. 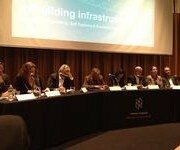 “Often found underground, or beyond the periphery of cities, the presence of urban infrastructure remains largely invisible until the precise moment at which it fails or breaks down.” Citing multiple recent failures in infrastructure across the United States, the symposium called for a change in the way we look at infrastructure and cities. Kevin Shanley, Gerdo Aquino and Ying-Yu Hung were part of the panel discussion, with Shanley presenting an alternative view of “building soft,” as evidenced by his multiple decades of work with the Bayous of Houston and the award-winning Buffalo Bayou Promenade. 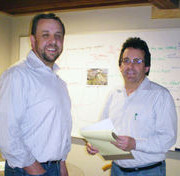 In March, the Laguna Beach office migrated closer towards the Pacific beachfront on Glenneyre Street. Just a month later in April, our San Francisco office moved across Market Street to a new building on Battery Street. Make sure to update your address books with the new locations or stop by and say hello! 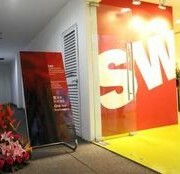 The SWA Shanghai office has been open for one year now! Celebrating with an open house, the new 25-person office also hosted this spring’s SWA management meeting. Last June, SWA’s Dallas office won a competition to design a 5-star, 350-room beachfront resort on Hainan Island. 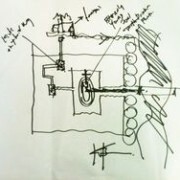 The winning design concept focused on “Rivers and Deltas,” integrating water as the central theme throughout the design. The project is currently in pre-development phases, undergoing analysis of adjacent properties and revising the plans to incorporate future phasing while also maintaining the strength of the original water-centric vision. An international-level University in West India is in the works, in conjunction with two American universities: University of Wisconsin and University of Massachucetts-Lowell. The Mumbai-based Plastindia foundation aims to educate several hundred engineers each year. SWA Group will help prepare the preliminary campus designs for the university of 2000 students, incorporating leading design practices such as rainwater harvesting and water recycling and incorporating housing for both students and faculty. Emaar Square is the urban center of Uptown Cairo, Egypt. It is a destination within the greater fabric of the city, and understood as a second downtown district in Cairo. The 65 acre site is set on a plateau formed by limestone known as the Mokattam Hills, located 8km southeast of Old Cairo City. Master planning for Emaar Square will focus on concepts which create a modern City Center that responds to the region’s natural environment, cultural forces and architectural heritage. The landscape will be sensitive to the desert ecology, designed for sustainability, and integrate both public and private open spaces throughout the site’s topography. The Spring announcement of the Texas ASLA Chapter Awards had seven different awards for SWA’s projects. Cross Creek’s Flewellen Creek Restoration Plan, Northwest Vista Community College, and Capella Pedegral won Merit Awards. BP Helios Plaza, Shenzhen Bay and Katy Trail received Honor Awards, and the Atlanta Connector project won an Award of Excellence. Five SWA Houston projects won awards from the Houston-Galveston Area Council of Governments for the 2011 Parks and Natural Areas Award competition. Buffalo Bayou Park Shepherd to Sabine Master Plan won Special Recognition in the Planning Process Category and Shopping Cart Graveyard won Special Recognition in the On-the-Ground Projects Under $500,000 group. Lake Houston Wilderness Park Phase I Improvements was recognized as a winner in On-the-Ground Projects over $500,000, with Rosemont Bridge and Phase 1 of Outer Loop Trail for Memorial Park each receiving Special Recognition in that category. Sausalito’s “Wusong Kunshan Huaqiao Wetland Treatment Park” won the Silver Award in the category: Social, Economic, and Sustainable Design Considerations through the American Council of Engineer Companies (ACEC). 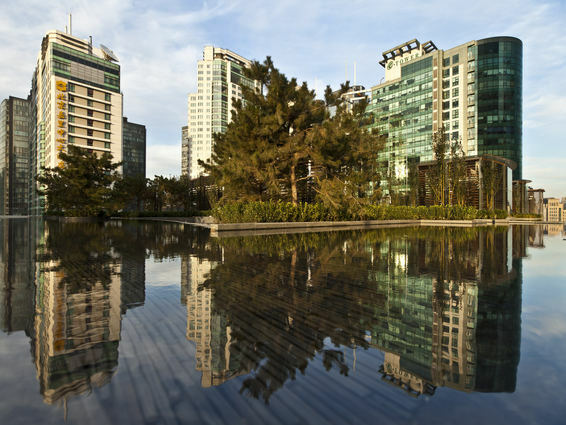 Kunshan Wetland Park integrates hydrological engineering design with land planning by making a water treatment system the central organizing structure of the 236-acre urban park. Sean O’Malley, Managing Principal for SWA Group, Laguna Beach, has been appointed as the Vice Chair of the Urban Land Institute Orange County and Inland Empire’s Edge Development Initiative Council. The Council will develop programs and research on such topics as the future of the master-planned community, and market-based land use planning for greater Orange County and the Inland Empire. 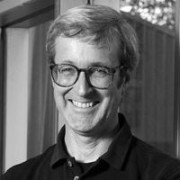 The University of California, Berkeley, College of Environmental Design selected John Wong to receive the 2012 CED/CEDA Distinguished Alumnus Award. The award highlights the outstanding work, careers and achievements of the alumni to the University. “There are many systems that really influence what a city is and the engineered infrastructure is a huge piece of it. Landscape is just as important as buildings and streets: in fact, it’s required. Secondly, infrastructure is required – freeways, train tracks, gas lines, and more. Right now the city and single use infrastructure are mutually exclusive. Infrastructure needs to learn from landscapes and cities and be a catalyst for making a better city.” Houston’s Managing Principal Kinder Baumgardner sits down to talk to Georgia Tech about the future of Infrastructure and with NPR about the business and art of designing our future cities. A new 130-acre development at UC Davis, California, “aspires to be the nation’s largest zero net energy community.” The first 23 buildings opened last fall, with the goal to provide solar shading, rainwater collection and absorption, and zero net energy use–a first for a project of this size. 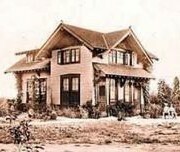 San Francisco Chronicle covered the project’s development. A hundred years ago, landscape architect Arthur Comey proposed Houston’s first comprehensive city plan. In his plan, Comey envisioned the city’s bayous overlaid with a network of parks and trails. As he wrote, the “bayous and creek valleys readily lend themselves to trails and parks and cannot so advantageously be used for any other purpose.” Read the full post by Kevin Shanley. The Katy Trail is a recent Rails-to-Trails project transforming an abandoned rail corridor into a hugely popular pedestrian-bicycle corridor linking over 20 neighborhoods in Dallas, Texas. As a networked infrastructure, this transformation has responded to an urban populace hungry for access to open space. Read the full post. As a prominent gateway into one of the world’s most creative cities, the terrain along the corridor between the Montreal-Trudeau International airport to Montreal’s downtown is the home of historic relics from the city’s industrial roots, crumbling highways, railways and a mid-eighteenth century canal. In its current state it doesn’t exactly reflect the creative, contemporary people and place of Montreal – but it is ripe with potential. Read the full post. Experiencing severe coastal storms has always been part of living near the sea; however, current planning models and infrastructures are putting residents in positions equivalent to placing their heads in the sand. What is the future for resilient coastal ecosystems and communities? Read the full post.